This year will be the 7th annual Back Alley bike-a-thon event, Bike the Blizzard. This year we’re hoping to raise $20,000 — more than past years, but with our ever enthusiastic riders and supporters we can do it! These funds allow us to keep the doors open during the cold weather months and allow other fundraising efforts to go towards staffing up for the busy summer months. This event allows Back Alley Bikes to stay open year round to provide quality education classes and distribute bikes to youth in Detroit. This event, as in years past, is a 24-hour ride-your-legs off endeavor. Riders will raise as much as they can and ride as much as they can. Riders can register, raise, and ride as individuals, or in teams. The ride is based out of the Cass Corridor Neighborhood Development Corp (CCNDC) Community Center adjacent to Back Alley Bikes and the Hub (bike shop). Here riders will find registration, a bike repair area, food, warming area, and perhaps a place for a catnap. Riders will be supported with on-call support vehicles, food, open shop, warming area, and a fun group ride! It’s starts at midnight on a Sunday? Yes, but this is Martin Luther King Jr. weekend and Monday is a holiday most people! 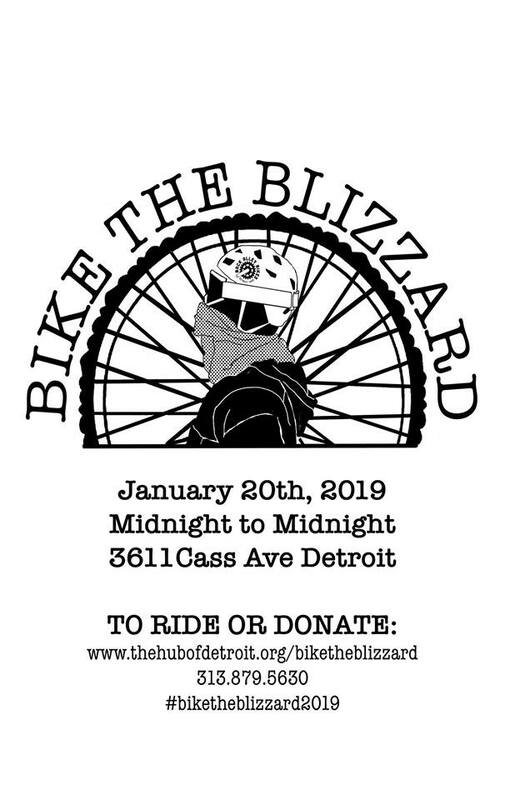 If you have questions, please contact us at biketheblizzard@backalleybikes.org. It’s super easy to register. Make a team and invite your friends, coworkers, and neighbors. Bike the Blizzard is more fun the more people are involved. You don’t have to fund raise online. We print donation envelopes to collect pledges by cash & check. Just email us that you want an envelope to raise money the old fashioned way. Rather not ride? You can donate! You can make a donation to one of the riders instead. Interested in volunteering? Please complete this form! Want to be a sponsor? Send us an email.